In an age of digital media, many computer makers have made a conscious move away from physical discs with the removal of DVD drives from its computers, such as Apple's Macbook Pro/Air, Google Chromebooks etc. But how to watch the DVD movies for those who probably amassed a collection of DVD movies? The next logical steps are to rip DVD to hard drive in digital formats and transfer DVD to media server throughout your network, which could not only refrain from the unnecessary waste of room space, but also makes it possible to enjoy all of your media, whether in your living room, the car, or on a boat in the South Pacific. To do that, you should make clear how to rip DVD discs to digital formats and then put DVD on media server for viewing on TV, game console, iPhone iPad Android or any other devices. Now let's go over it step by step. If you have a loads of DVD collection, you must be vexed inevitably for the cases that your shelves are chocked up with DVD discs, taking too much space of room space; it's always hard to find a target DVD movie for watching from a head of DVD discs; and even you cannot watch DVD movies directly on Apple TV, Chromebook, iPhone iPad Android devices which has no DVD hard drive. Thankfully, all these can be resolved only if you convert DVD to digital copy with a superb DVD ripping software. 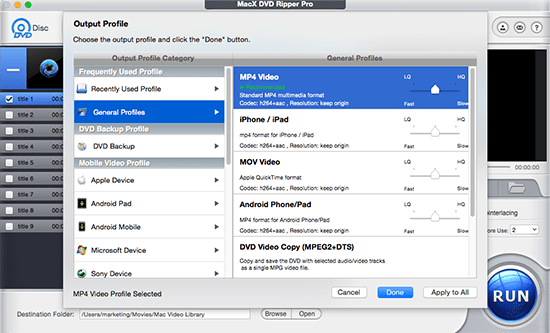 MacX DVD Ripper Pro is one that converts DVD to MP4, MOV, AVI, MKV, ISO image, MPEG2 or any other media server supported formats, regardless of any types DVD discs, such as Disney 99-title DVDs, TV series DVDs, workout DVDs, new released DVD movies, and other damaged or unplayable DVDs. Besides, thanks to the hyper-threading, multi-core CPU and the unique Intel QSV tech, you can rip DVD to media server compatible formats with original quality at blazing fast speed, up to 5 minutes only for a full copy of DVD. How to Convert DVD to Digital Copy in MP4, MOV, MKV etc. Step 1: Free download the DVD to media server ripper for Mac and launch it. Or grab the Windows version and run it on your PCs. Then insert your favorite DVD disc and load it by drag and drop, or clicking "DVD Disc" button. It will automatically scan the right title for you. See rip protected DVD on Mac. Step 2: Choose the output format. As you'd like to rip DVD to NAS, PLEX home media server for more convenient watching, you are suggested to tap "General Profile" to select MP4 as output for its wide compatibility among popular devices. Step 3: Click "Browse" button to specify the output folder path to save your converted DVD digital copy where you like. Step 4: Hit "RUN" button to start converting DVD movies to MP4 for transferring to DLNA media server. You should know that most movies comes with some kind of Digital Rights Management (DRM) encryption. I feel that since I bought these videos I should have the right to do with them what I want -- so long as I don't try to sell or distribute their contents to others. I am not a lawyer though and this is a legal gray area. If you decide to follow a similar course, you should be fine, but neither I nor the software company can be responsible for any legal damages result from this DVD converting guide. Got that? Once you got your DVD library ripped to digital formats, you're now able to transfer DVD movies to media server. But first you need to get a DLNA media server. There are a number of media servers available which will do this either free or economically. Plex is a well-known media server running on cross-platform, with a wide range of supported devices and easy-of setup. It's free to share media on your local network, with Plex offering a paid Plex Pass to enable additional features such as cloud streaming and media syncing. 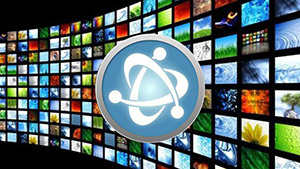 Universal Media Server is a media server capable of serving videos, audio and images to any DLNA-capable device. It is free, regularly updated and has more features than any other media server, including paid media servers. It streams to many devices including PS3, PS4, Microsoft Xbox One and 360, many TVs (Samsung, Panasonic, Sony, Vizio, LG, Philips, Sharp), smart phones (iPhone, Android, etc. ), Blu-ray players, and more. PlayOn is a DLNA media server and browser for your Windows PC . It is one of the few media servers that offers support for online media sources such as Netflix, Hulu, Amazon, HBO and 100 other popular streaming sites. It makes it possible to watch anywhere, anytime, on any device, without the commercials, and even offline. In view of the fact that Plex media server is widely welcomed to stream DVD movies to Apple TV, Chromecast, Roku box, here I take Plex as an example to transfer DVD to media server. 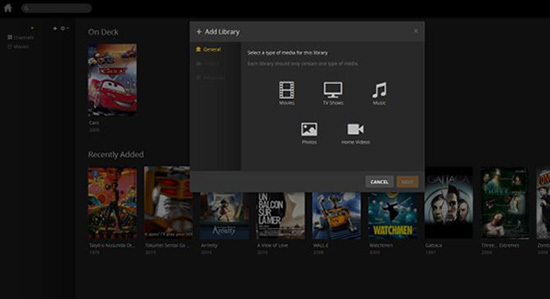 Step 1: Sign up for your free account and download the Plex Media Server software, which will organizes all of your media including converted DVD digital copy. Step 2: Add library by clicking "Add Section" button and selecting "Movies". 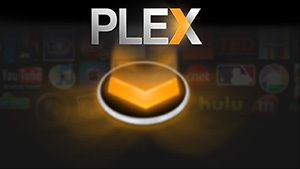 Plex recognizes just about any kind of video format and displays all of your content in an easy-to-navigate interface. Step 3: Select the DVD rips you want to add and click the Add Folder button. Step 4: Tune into Plex and by use of DLNA-friendly device, like stream DVD to Roku box, Chromecast, gaming console for watching on different devices. Learn how to copy and stream DVD to Chromecast 1/2/Audio/Ultra and cast DVD from computer to TV using Chromecast smoothly with HD video quality. What to do if you plug in your external hard drive to Mac, but it doesn't show up? Find out the solutions here. This article will elaborate the possible causes of external hard drive won't show up and help you fix external hard drive not showing up problems on Mac. This post offers troubleshooting to DVD stuck in SuperDrive and helps you to eject a stuck DVD from Macbook Pro/Air, iMac, Mac Mini with ease, so that you can watch DVD movies with no SuperDrive ejecting error. MacX DVD Ripper Pro is the best DVD to media server ripper which can freely remove any DVD protection and rip/convert DVD to MP4, MOV, AVI, WMV, MKV, MTS, MP3, etc. video formats and portable devices (iPhone iPad Android) with original quality.